Foreign direct investment (FDI) into Africa has grown quickly in recent years (Figure 1). FDI was estimated to reach USD56.5 billion in 2016, a 23% increase over the level in 2010. FDI now accounts for almost a third (32%) of total financial inflows into the continent and exceeds the level of official development assistance for Africa (USD 50.2 billion) (AfDB/OECD/UNDP, forthcoming). FDI to Africa represented 11.5% of global FDI in 2016, with 642 projects accounting for 4% (fDi Markets, 2017). Investors come from both developed countries, notably from the United Kingdom, France, the United States, and from the emerging economies of China, India, South Africa and the United Arab Emirates. The latter group are investing more heavily into Africa: Chinese companies announced more than USD30 billion in investment in greenfield projects across Africa in 2016, compared to USD8 billion in 2008. 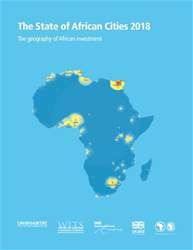 The State of African Cities 2018 is published by IHS-Erasmus University Rotterdam and UN-Habitat in partnership with the African Development Bank. The aim of the report is to contribute to development policies that can turn African cities into more attractive, competitive and resilient foreign direct investment (FDI) destinations. Attracting global FDI is highly competitive and crosses various geographic scales, therefore regional cooperation by cities and nations is critical. But FDI is not a panacea since it has both positive and negative effects and careful choices need to be made by cities in their pursuit of FDI, if it is to lead to inclusive economic growth. This report aims to provide guidance on these choices and to facilitate understanding of the complexity of global investment in Africa. Chapter 3 Do Sub-Saharan Cities with Lower Labour Costs Attract Greater FDI Inflows?